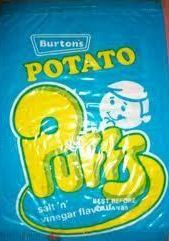 Now I can remember getting these from my tuck shop at school. They were really light curved tubes of crispy fried potatoes and a popular way of eating them was to smash up the bag and just eat the crumbs. A favourite of mine from the early 70s that sadly seems to have joined the rest of the great sweets of the 70s and been consigned to memory.